If you couldn’t tell by our last post about springy design motifs, we’re looking forward to getting past winter and into next season. In fact, with some of the top spring color trends already out, we thought it’d be fun to let you in on the new “in” hues and offer advice for incorporating them into your spring garden. Firstly, Pantone’s 2011 Color of the Year Honeysuckle definitely lends itself to the garden since it’s named after the reddish-pink plant. 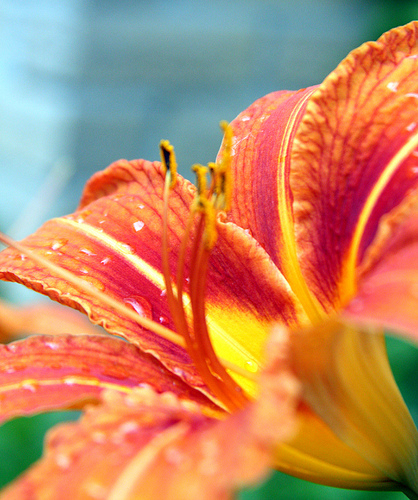 Orange is continuing its stint as a color in vogue, and you can add it to your garden with tiger lilies. With silver and grays also in style, garden in containers like popular zinc planters. With so many ways to bring the color trends into your garden next season, your garden could be the most fashionable one on the block. Contact or visit Marvin Gardens in Wilton, Connecticut, for great garden accessories. At Marvin Gardens we like to keep up with the latest design trends, and what better place to see them emerge than at home design trade shows like last week’s Maison & Objet in Paris? Design blog Apartment Therapy followed the action at the January event, and we were especially excited to see them report on a trend that ties in gardening and design: the new wave of floral patterns showing up on textiles and wallpapers. To keep up with all our updates on design trends, gardening tips and more the second they’re out, like Marvin Gardens on Facebook and follow us on Twitter @MarvinGardensCT.